PHUKET: Bangkok-born Isara ‘Ids’ Thaotong believes that art is everywhere and in everything, including in much of the interior design work he is responsible for around the island. Ids (above right) stands by his character Peepho, who here is swinging on a tree. 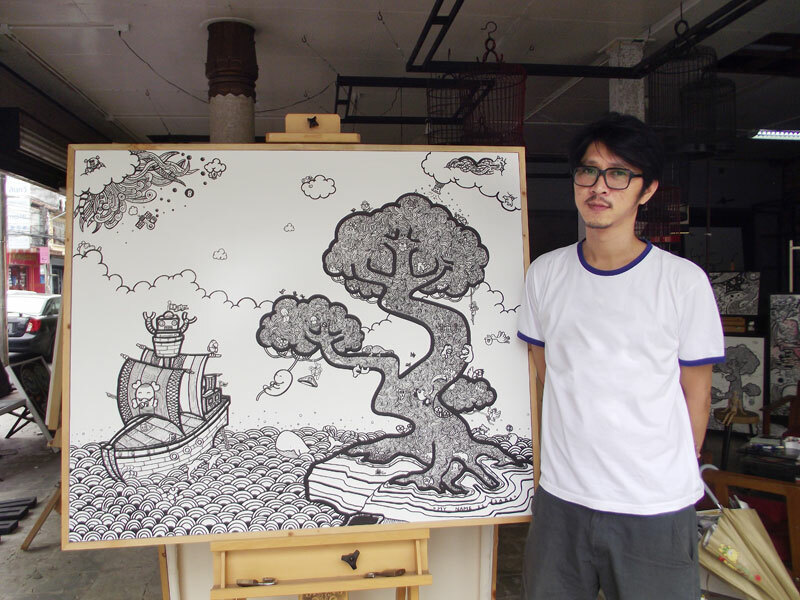 For now though, he is happy to be quietly working in his Phuket town studio; sketching, painting and daydreaming. Ids studied at Rangsit University in Bangkok, where he obtained a Fine Arts degree before moving to Phuket, where he designed the Pearl of Nai Thon nightclub in Nai Thon and the Unity condominiums in Patong, before quitting the profession. “I stopped doing interior design because it was boring. I prefer doing my own art because it is solely my creation, whereas the commissioner or the owner of a project tends to give me his or her ideas or orders otherwise, and I am expected to follow,” Ids says. Four months ago that all changed when he opened up the Drawing Room art studio, located close to the corner of Phang Nga and Phuket Roads in the Old Town. Ids tends to create two very different styles of work: manga-inspired, bold, black and white doodles, done with a simple marker pen, and more introspective abstract acrylic paintings. The fun sketches contain the loveable fat character ‘Peepho’ who appears in many scenarios. “These I do for fun and when relaxing. It’s a flight of fancy when I’m day dreaming,” Ids explains. The Drawing Room plans to have its first exhibition later this month, but no date has yet been set. For more information, contact Ids at: isara380@hotmail.com or 086-899-4888.